The mission of the ARHyA is to provide a character and leadership building program that will enable our youth to engage in activities to help promote the Ranch Horse Industry as well as building lifelong relationships with their fellow exhibitors. 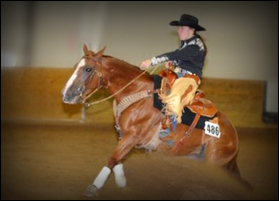 The American Horse Association Youth Division was created to promote and encourage the Youth members of the ARHA on a charter and national level, and to promote the general interest of Youth and the ranch horse. ARHA Youth will learn meet new friends and make great memories. The ARHA offers competition to Youth of all ages and experience levels. The ARHA World Championship Horse Show, Regional, and Charter Shows bring ARHA Youth members together from all over. 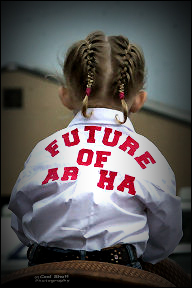 The ARHA Novice Youth Division is for the beginner that is new to showing with little or no show experience or skill in showing horses. The purpose of this division is to aid in raising the confidence and skill levels of the new exhibitor and give them an opportunity to have some success showing against people with the same skill level. The novice division is open to any ARHA member who meets all Novice criteria below. If a member/exhibitor has any questions, the ARHA office must be contacted for clarification on any rule. If you have actively participated in another national equine organization or discipline for three (3) consecutive years, bartered any type of remuneration for training astride, showing, giving lesson, you are NOT considered a novice therefore ineligible to compete in the ARHA novice amateur or youth divisions. The Novice Youth Program is open to any ARHA youth member who possess a current ARHA Youth card and meets all Novice Youth criteria. A Youth Card with a Novice notation will be issued to each youth who supplies ARHA with a signed Eligibility Statement. This designation is offered to encourage exhibitors who have shown and have been successful in riding events, to also enter ARHA cattle classes. 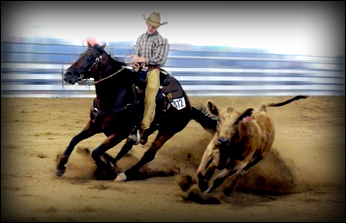 The American Ranch Horse Association remains committed to developing horses and exhibitors that are confident in all aspects of an all-around program that includes cattle classes. The ARHA recognizes that exhibitors new to the association may have strong competencies in dry work areas yet have never shown in the cattle events. This designation as a novice in “Cattle Only” will allow these exhibitors, and seasoned ARHA youth exhibitors who have not tried the cattle classes, to compete with others who are also new to these events. Youth exhibitors who do not qualify for the novice program may request Novice Cattle Only eligibility. Novice Cattle eligibility is reserved for Youth exhibitors who have not previously shown in any cattle classes or events. Application/Renewal for the ARHA Novice Youth Cattle Only designation must be submitted each year of potential eligibility. Falsifying the Novice Cattle Only application will result in disciplinary action by the association. ARHA reserves the right to verify information provided by an applicant and to refuse eligibility as a Novice Cattle Only exhibitor. This determination will be provided to the applicant in writing. The ARHA Youth Foundation has been awarding annual scholarships since 2009! There have been many generous donations from members and charters to transform a goal into reality. From its inception ARHA has had the vision of a program to support and promote its youth members. The achievement of forming a funded foundation that awards annual scholarships to both youth applicants who are graduating seniors, as well as to the previous year’s high point award winner is a major accomplishment. The ARHA mission statement says that we promote well broke, reliable working horses, and members who share a love the equine athlete. We promote this scholarship program to help our youth who share these same values. ARHA is truly proud of our youth and believe they will help propel this organization into the future. From time to time, members and charters will have the opportunity to help our youth through auctions, raffles, and other fund raising projects. Please help support these programs. Any time you wish, a donation can be made to the Foundation by contacting the ARHA office. Please remember, your donation is tax deductible, and will promote the youth development of ARHA for a lifetime.